Kwara denies owing workers, pensioners – Royal Times of Nigeria. The Kwara Government on Wednesday denied owing salaries and pension arrears. The Commissioner for Finance, Alhaji Demola Banu, made the denial in a statement issued in Ilorin while reacting to a media report. Banu stressed that the government was up-to-date with payment of salaries and pensions to workers and retirees. 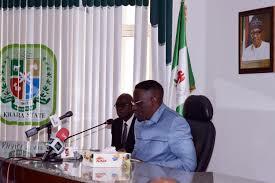 The commissioner, however, said that payment of local government workers was being delayed due to decline in allocations to local councils from the federation account. Banu said that the challenge was a reflection of the current national economic downturn which had limited the capacity of governments at all levels to meet salary obligations. He said that the state government had on different occasions assisted the local councils by augmenting their allocation to enhance their capacity to pay salaries. The commissioner said that the government would use its share of the second tranche of the Paris Club refund, to assist the councils to clear their salary and pension arrears. Banu recalled that the state government had released N3.4 billion to the local councils as their share of the first tranche of the Paris Club refund.